We invite all IVY/Seven Sister School alumni and their guests to a chess social for players of all levels and ages. This is a great opportunity to socialize, network with other alumni, and take part in casual games. You can come and leave at anytime. Door admission for player and observer: $15 per person by check or cash only. ● Free parking in the underground garage at the address above. ● Soft drinks and lite munchies will be included. Additional food can be ordered, but is at your own expenses. Sandbox does not yet have a liquor license. 1. Advance registration can be made only by mailing this form with a check in advance to the address below, or paying by credit card in advance. All payments must be received by February 24, 2019 to qualify for the advance registration price. There is no registration by fax, email or telephone. 2. Requests for refunds must be received by February 24, 2019. 3. Door admission is limited to availability of spaces. NO credit card is accepted at the door. 4. 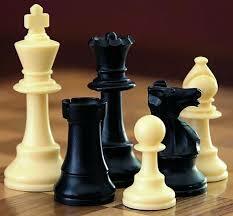 There will be chess sets available at the event, but it would be helpful for attendees to bring their own. 5. Each attendee is responsible for any damage to the facility, injuries or accidents in connection with this function.